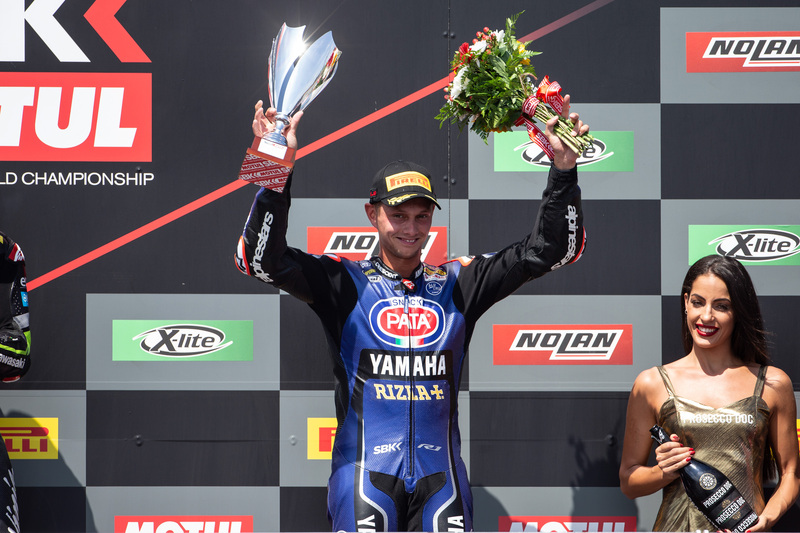 Third in World Superbike Race 1 yesterday, Pata Yamaha Official WorldSBK Team rider Michael van der Mark went one better today, with a superlative ride to second place after a tremendous battle at the front of the field in Race 2 at Portimão. Alex Lowes took a hard-fought 11th place and more important championship points today, having not quite managed to find a confident feeling with his Yamaha YZF-R1 at the technical and demanding Portimão circuit this weekend. Starting seventh on the grid following his third place yesterday, van der Mark settled quickly into the race before starting his push towards the front on the third of 20 laps. The 25-year-old eventually forced his way through to fourth, and then closed on the podium group by mid-race distance. With eight laps to go van der Mark took advantage of an attack by Marco Melandri on Chaz Davies and made an incredible pass on both on the inside exiting turn one. The Pata Yamaha rider then made a concerted effort to chase down championship and race leader Jonathan Rea, narrowing the gap to less than half a second, but finally the gap proved insurmountable in the laps remaining. Van der Mark took the chequered flag in second place to secure his ninth podium finish of the season and maintains third in the championship standings with 284 points, but now just 20 points behind second-placed Davies with six races remaining. The Portimão weekend proved a difficult one for Lowes who, despite his and the team’s best efforts, never really found the confidence in his Yamaha YZF-R1 that his fast and aggressive riding style demands. A technical issue in yesterday’s race meant that the 28-year-old started from the fifth row of the grid today, with the result that he was held up by traffic in the early laps. Once clear of the traffic Lowes rode an intelligent race to a points scoring finish in 11th place. The Pata Yamaha rider was disappointed with the result, but remains confident of improvement next time out in Magny Cours.